I love to read non-fiction stuff. I was never really "reading" when I was younger. I read books because it was required, not because I grew up yearning and wanting to do it. But I love National Bookstore. It's my favorite place to go to when i'm inside the mall. I have this thing for school and office supplies stuff. I need to have those post-its and those teeny weeny stapler. They have everything! And then one day I learned about National Bookstore's Cubao branch and found out that several floors are dedicated to promo items including books. It sparked my interest in reading books because I want to, not because i need to. And then I get lost everytime I go there. I specifically love memoirs of normal people - no celebrities please. It feels so real and I can so relate with some of my books (which are incredibly cheap!). Memoirs of drug addicts, abortion addicts, a daughter of a funeral director/owner, 9/11 survivors, divorce addicts and many more. I am currently reading Long Past Stopping: A memoir by Oran Canfield - son of the famous Chicken Soup For the Soul guy, Jack Canfield. I love you Jessica Zafra! Moving on, I am not a couch potato. I can live without a TV. I got rid of my TV two years ago. It just wouldn't work one day (even if I didn't use it that often) and after it was fixed, I didn't put it back in my room. Why? It occupied too much space - naaa, I just don't need it. After that, I got to read more books and still retain my 20/20 vision (according to LTO). But then, I fancy watching shows like Storage Wars, L.A. 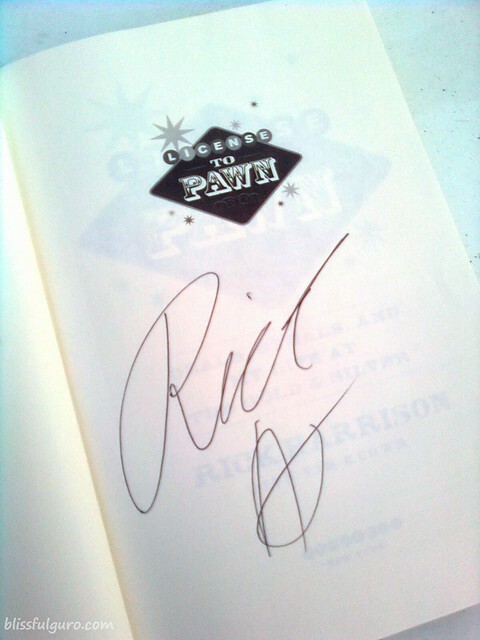 Ink, Miami Ink, Kings of Restoration, American Pickers and Pawn Stars - in History channel, BIO or C.I. Non-fiction stuff on TV, just the way I like it. I was blog hopping and have I told you that I'm also a Jessica Zafra fan? 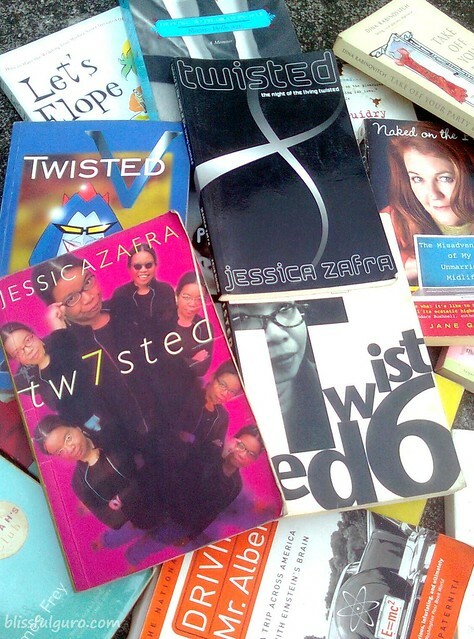 I have almost all of her Twisted books and I read her blog regularly. 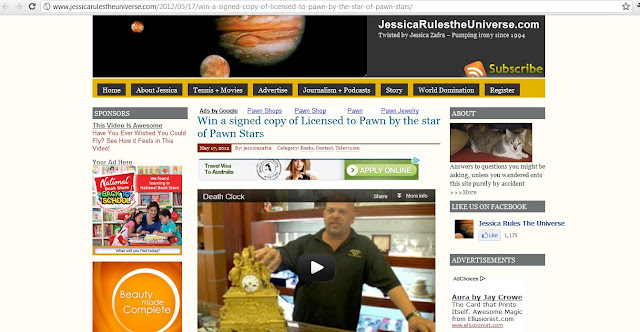 I digress... As I was browsing on her site jessicarulestheuniverse.com, I saw her latest contest about Pawn Stars - one of my favorite shows. 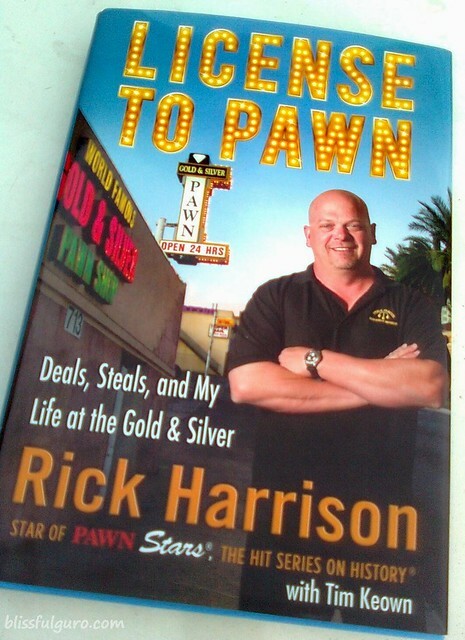 The post was entitled; Win a signed copy of Licensed to Pawn by the star of Pawn Stars. 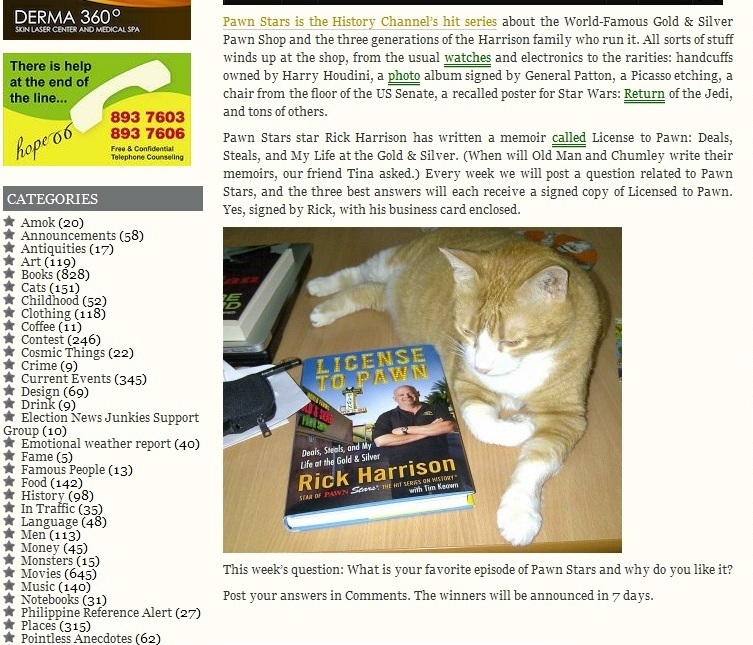 At that time I was actually watching the Pawn Stars re-run. Can that be a sign? Will I actually join on this one? What if I lose? I have a fear of rejection pa naman. Ok, I'm exaggerating but what happened was I joined. 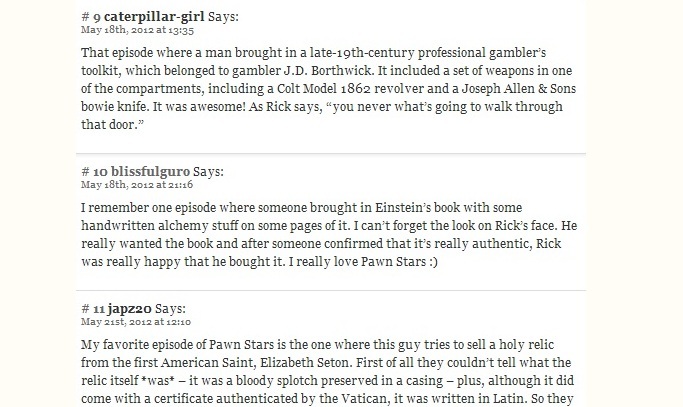 I love Pawn Stars and I know the details of my favorite episodes by heart. The contest was for three weeks. Jessica will choose three winners each week. I did join the first week and answered the question. After a week, she posted the winners and... I didn't get to see my name on it. I didn't win. And I didn't join the next week's contest. So after a week, I blog-hopped again and saw the second batch of winners. I was scanning through the post when I saw my username - blissfulguro... And then I realized I won! Without even answering the second week's question. Apparently, my answer on the first one qualified for the second one. Great! I was asked to leave my full name on the comment portion and I need to go to National Bookstore in Rockwell to claim my prize. Fast forward to the day I claimed my prize. While inside the store, I asked the personnel in-charge about it. She said that my name wasn't on the list. I was stunned. How can that be? I was about to leave when I thought of trying my luck on my username - blissfulguro. And there it was, my username in bold letters. Whew! I was glad that I thought of that. wow congrats~!! grabe wala akong luck sa mga pa contest contest and raffles! O.o kahit man lang candy sa parlor games. am i that unlucky? chos! 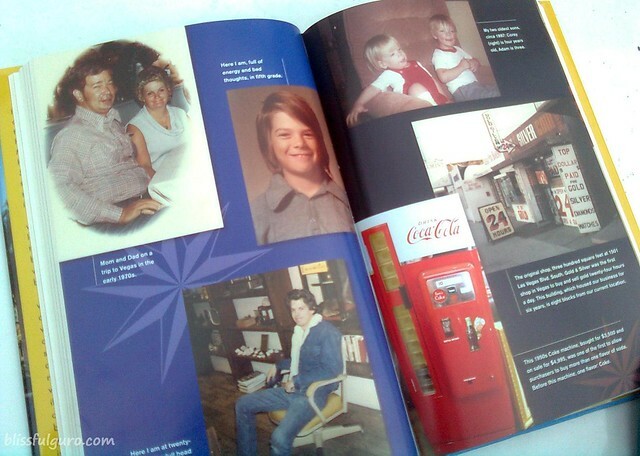 id love to have that book too! yihee! nabasa mo na ba mia?